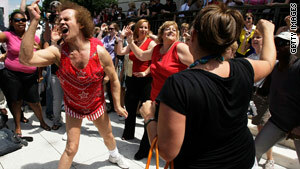 Exercise guru Richard Simmons offers fitness tips on Twitter. With 2010 only hours old, it's a statistical certainty that some New Year's resolutions have already crumbled and fallen faster than the sparkly ball in Times Square. But it's not too late to try again. Or, if you're one of the fortunate ones who has held onto your resolutions this long, maybe this is the time that oath to lose weight, quit smoking or get your finances in order will actually stick. We could all use a little help in that regard. And once again, Twitter is here for us. We've rounded up five Twitter feeds that may help keep those promises to yourself going until 2011. Whether you're looking to eat healthier, get more exercise or quit smoking, you'll find tips, advice and encouragement here -- along with more than 1 million other health-conscious folks. The official feed of Health magazine, these updates include its articles and a roundup of health-related news from other places, as well. You've probably seen their provocative television commercials. And while Truth is an anti-smoking campaign targeting kids and teens, there are plenty of tweets on here to remind anyone trying to quit why it's a good idea. Sample tweet: truth wins AdWeek Media's online poll of Ad Campaign of the Decade! thanks to all who voted and all who support what we do. Teal's bio describes him as "A real life, shirt and tie, 'middle manager' that applied what he learned in business to getting fit." In the interest of full disclosure, his feed does link to a Web site where Teal advertises a DVD series and other weight-loss items. But he also offers tips and encouragement on the feed, plus links to articles on losing weight and building muscle that don't require shelling out any cash. Sample tweet: [ Tip ] Put unhealthy snacks at the back of the cupboard or fridge. Put them in plain dark containers. Or just get rid of them. Maybe your resolution is to get your money right -- get out of debt, save more or just stop spending on stupid things. If so, you've got a kindred spirit in Ramsey, the syndicated talk-show host who shells out homespun advice on saving and getting out of debt. Lots of the posts here come from Ramsey's producers, with links to Ramsey's posts on the show's Web site and retweets from fans who have used his advice to get out of debt. Whether you're actually after some weight-loss inspiration or just want to be entertained by the flamboyant, short-panted "Sweatin' to the Oldies" icon, here's a fun feed to follow. This feed has plenty of the enthusiastic weight-loss advice Simmons is known for. There is not, however, any mention we can see of the Deal-A-Meal. Sample tweet: I wish you a happy and healthy week on this Monday! But I also wish you...a sweaty week. That's right!